Joe Harris, Art Taylor, drums. Nesuhi Ertegun is the producer or coproducer (along with Jerry Wexler) of the material on the second CD, an overview of Ray Charles' delvings into jazz during his Atlantic period. Nesuhi either surrounded Ray with compatible members of the jazz community or members of his own band. Either way, it worked. Ray, via his R&B recordings, had caused quite a stir among jazzmen of the day, contributing, along with Horace Silver and others, to the "soul jazz" or hard-bop movement back to the music's roots, while staying true to bebop's high musical standards. 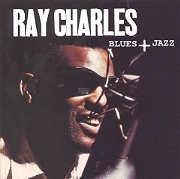 Atalantic was recording Ray in a jazz setting as early as April 1956. Two examples from that session heard here, the Gershwin brothers' "The Man I Love" and Teresa Brewer's pop hit "Music, Music, Music," feature Ray in a trio format with the great Oscar Pettiford on bass and Joe Harris on drums. In November, the band was in New York for a week (probably appearing at the Apollo Theatre) and cut three sessions. We have chosen seven tracks from this outing. The first, "I Surrender Dear," Bing Crosby's great hit of the 30s, finds Ray on celeste. This was nothing new for him; he played the instrument to great effect on his first hit, "Baby Let Me Hold Your Hand." After an opening statement from the horn section, Ray solos on "Hornful Soul" in the "locked-hands" manner made famous by Lionel Hampton sideman Milt Buckner. On Fats Waller's "Ain't Misbehavin'," check out how RC wraps around David Newman during the latter's solo, never once upstaging his star-within-the-band. Newman's double-time preaching at the end of the bridge is perfection. Ray calls "Sweet Sixteen Bars" his instrumental version of "A Fool For You." "Doodlin'," a nod to fellow soul brother Horace Silver, was later done in a vocal version by Sarah Vaughan. Here Joe Bridgewater takes the trumpet solo, followed by Fathead on tenor; the latter also shines on "Undecided." "Rockhouse" was released as a two-part single and was a jukebox favorite. Here, Ray runs the gamut from Ray Bryant to Milt Buckner, showing where Ramsey Lewis got his stuff. Nesuhi's choice to pair Ray with vibraphonist Milt Jackson was nothing short of inspired. Both play with so much gospel feeling in their blues that you want to pass the collection basket. On "X-Ray Blues," they are joined by guitarist Kenny Burrell, Percy Heath on bass, and Art Taylor on drums. After Bags, Kenny solos, followed by Ray, first on alto sax and then on Wurlitzer. "Love On My Mind," written by Ray, is Ray and Milt all the way. Both tunes appeared on their LP Soul Meeting. The next four cuts come from the album that introduced David Newman to the jazz public, Fathead: Ray Charles Presents David Newman, recorded in November 1958. Most of the tunes were arranged by Hank Crawford; the title song, "Fathead," an exception, was charted by David. It is a blowing session, with solos by Newman, Marcus Belgrave on trumpet, Crawford on baritone, and Ray on piano. "Bill For Bennie" features the same solo lineup, with an expecially strong statement by Bennie "Hank" Crawford. "Hard Times" is simply a classic of the first order. Fathead is on alto here, and he soars, shaping a work of beauty seldom equaled in the annals of jazz. The haps were happening that day, as we move on to the jazz war-horse "Willow Weep For Me." After a brilliant Charles Brownish piano intro by Ray, David is again heard on alto, followed by Belgrave, a lovely RC piano break, and back to Fathead and a wonderful outro by Ray. These four cuts alone show Ray and his band to be a hard-bop aggregation equal to any of their contemporaries. Our final selection, Milt Jackson's "The Spirit-Feel," comes from a tape recorded on a portable tape machine by disc jockey Zenas Sears at a concert in Atlanta on May 28, 1959--on one microphone! It is an example of how the band could kick in a "live" situation. Everybody solos: Belgrave and John Hunt on trumpets, Fathead on tenor, Hank on baritone. Although he would dabble from time to time (Genius + Soul = Jazz on Impulse, for example), Ray Charles has never, since Atlantic, been given--or taken--the opportunity to record jazz so extensively. It is our loss, and perhaps his too. As we can hear on this CD, Ray is one of the masters of the genre. --BILLY VERA, from the liner notes.